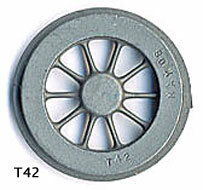 A full set consists of 4 x T57 outer drivers, 2 x T58 mid drivers, 6 x T42 tender wheels. 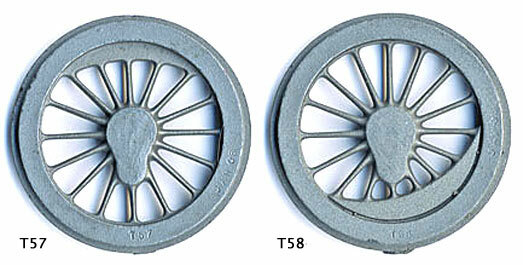 The smaller than scale tender wheels in the design allow for a flat tender floor without wheel arches. NOTE: There are some photographs of models (in 'Project' books) showing weights the same on all wheels. I have not seen any photographs of Midland 4Fs without the different weight in the centre driver. The model error may be due to lack of a suitable outline drawing in the 'Project' book.